The Law Office of George G. Romain is an established employment law practice based in Manhattan Beach and serving all of Southern California. 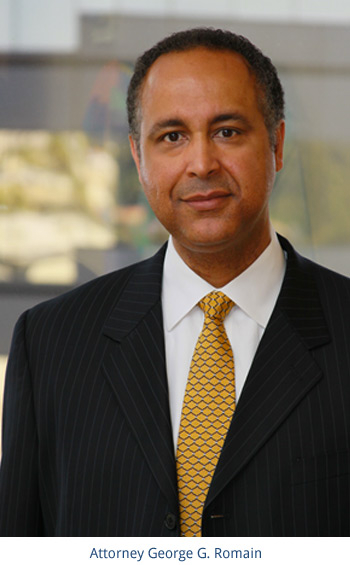 Under the direction of leading attorney George G. Romain, our firm provides skilled representation to individuals and businesses facing a wide range of civil litigation matters, particularly in the areas of employment and wage & hour disputes. Backed by 25 plus years of trial experience, we use our knowledge and experience to successfully argue cases before state and federal trial courts, administrative agencies and courts of appeal. Our experience and expertise in civil litigation allows us to provide our clients with a wide array of services normally relegated to large, corporate firms. For that reason we handle complex, high exposure cases in the following five core practice areas: Employment Law, Business Litigation, Professional Malpractice, Insurance Law and Personal Injury. Serving plaintiffs and defendants, our law office provides aggressive representation to address the individual needs of our clients in an effective and economical fashion. We place an emphasis on client service, which means that we provide each client with candid advice which allows them to make sound decisions. We work hard to create relationships based on honesty, integrity, and trust. This includes providing ethical advice, regular status updates, and responsive service. Clients are also encouraged to contact our firm throughout the duration of their case to discuss concerns as they arise and ask questions about the road ahead. NO RISK REPRESENTATION in most plaintiffs’ cases, our expert representation is offered on a contingency fee basis. This means that you don’t have to pay us a penny until we win you a settlement. And for defense cases and for our corporate clients, we offer competitive hourly rates compared to those of large firms. To schedule your free initial phone consultation or learn more about our law office, please contact us online or at 310-321-6640. We serve all of Riverside, San Bernardino, Southern California and Los Angeles County including: Torrance, Redondo Beach, Gardena, Palos Verdes, Lakewood, Carson, Long Beach and more! Employee Representation We protect the rights of employees and take the time to create a personalized legal strategy for each client that will help them reach their goals. Employer Representation If you’re an employer who is faced with any type of employment law concern contact us and we will provide timely and sound legal advice. Core Practice Areas Legal disputes and litigation can become a drain on time, resources, and emotions. We handle a wide variety of civil litigation matters.